Yerba is spanish for herb and mansa for tranquil or calm. Also known as lizard tail, Yerba mansa is characterized as having a white spiked basal flower surrounded by striking white bracts that are often mistaken for petals. Leaves are large, flat and a deep green. As the plant matures it will devlop red to purple stains on all of its aerial parts, the entire plant turning brick red in the fall. 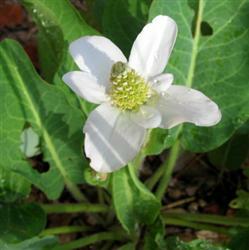 Yerba mansa has very aromatic roots reminiscent of a cross between camphor and ecualyptus, a very distinct spicy scent. This low-growing plant is at home in moist conditions, tolerates shade well, as well as alkaline conditions. It will spread to form a fairly dense mat and is useful on those moist, shady corners where other plants struggle to flower.